This is not a post about semantics. Using “N=1” to refer to self-experimentation is okay, as long as one understands that self-experimentation is one of the most powerful ways to improve one’s health. Typically the term “N=1” is used in a demeaning way, as in: “It is just my N=1 experience, so it’s not worth much, but …” This is the reason behind this post. Using the “N=1” term to refer to self-experimentation in this way is both incorrect and misleading. Often each individual measurement, or row, will be associated with a particular point in time, such as a date. This will characterize the measurement approach used as longitudinal, as opposed to cross-sectional. One example of the latter would be a dataset where each row referred to a different individual, with the data on all rows collected at the same point in time. Longitudinal health-related measurement is frequently considered superior to cross-sectional measurement in terms of the insights that it can provide. As you can see, the dataset has 10 rows, with the top row containing the names of the variables. So this dataset contains nine rows of data, which means that in this dataset “N=9”, even though the data is for one single individual. To call this an “N=1” experiment is incorrect. As a side note, an empty cell, like that on the top row for HDL cholesterol, essentially means that a measurement for that variable was not taken on that date, or that it was left out because of obvious measurement error (e.g., the value received from the lab was “-10”, which would be a mistake since nobody has a negative HDL cholesterol level). The N of the dataset as a whole would still be technically 9 in a situation like this, with only one missing cell on the row in question. But the software would typically calculate associations for that variable (HDL cholesterol) based on a sample of 8. Calling self-experimentation “N=1”, meaning that the results of self-experimentation are not a good basis for generalization, is very misleading. But there is a twist. Those results may indeed not be a good basis for generalization to other people, but they provide a particularly good basis for generalization for you. It is often much safer to generalize based on self-experimentation, even with small samples (e.g., N=9). The reason, as I pointed out in this interview with Jimmy Moore, is that data about oneself only tends to be much more uniform than data about a sample of individuals. When multiple individuals are included in an analysis, the number of sources of error (e.g., confounding variables, measurement problems) is much higher than when the analysis is based on one single individual. Thus analyses based on data from one single individual yield results that are more uniform and stable across the sample. Moreover, analyses of data about a sample of individuals are typically summarized through averages, and those averages tend to be biased by outliers. There are always outliers in any dataset; you might possibly be one of them if you were part of a dataset, which would render the average results at best misleading, and at worst meaningless, to you. This is a point that has also been made by Richard Nikoley, who has been discussing self-experimentation for quite some time, in this very interesting video. Another person who has been talking about self-experimentation, and showing how it can be useful in personal health management, is Seth Roberts. He and the idea of self-experimentation were prominently portrayed in this article on the New York Times. Check this video where Dr. Roberts talks about how he found out through self-experimentation that, among other things, consuming butter reduced his arterial plaque deposits. Plaque reduction is something that only rarely happens, at least in folks who follow the traditional American diet. HCE generates coefficients of association and graphs at the click of a button, making it relatively easy for anybody to understand how his or her health variables are associated with one another, and thus what modifiable health factors (e.g., consumption of certain foods) could be causing health effects (e.g., body fact accumulation). It may also help you identify other, more counter-intuitive, links; such as between certain thought and behavior patterns (e.g., wealth accumulation thoughts, looking at the mirror multiple times a day) and undesirable mental states (e.g., depression, panic attacks). Just keep in mind that you need to have at least some variation in all the variables involved. Without variation there is no correlation, and thus causation may remain hidden from view. This comes also from the widely cited Brunner and colleagues study, published in Diabetes Care in 2006. They defined a person as glucose intolerant if he or she had a blood glucose level of 5.3-11 mmol/l after a 2-h post–50-g oral glucose tolerance test. For those using the other measurement system, like us here in the USA, that is a blood glucose level of approximately 95-198 mg/dl. Quite a range, eh!? This covers the high end of normoglycemia, as well as pre- to full-blown type 2 diabetes. In this investigation, called the Whitehall Study, 18,403 nonindustrial London-based male civil servants aged 40 to 64 years were examined between September 1967 and January 1970. These folks were then followed for over 30 years, based on the National Health Service Central Registry; essentially to find out whether they had died, and of what. During this period, there were 11,426 deaths from all causes; with 5,497 due to cardiovascular disease (48.1%) and 3,240 due to cancer (28.4%). The graph below shows the age-adjusted survival rates against time after diagnosis. Presumably the N values refer to the individuals in the glucose intolerant (GI) and type 2 diabetic (T2DM) groups that were alive at the end of the monitoring period. This does not apply to the normoglycemic N value; this value seems to refer to the number of normoglycemic folks alive after the divergence point (5-10 years from diagnosis). That is, it took between 5 and 10 years of high blood glucose levels for any effect on mortality to be noticed. One would expect at least some of the diagnosed folks to have done something about their blood glucose levels; a confounder that was not properly controlled for in this study, as far as I can tell. The glucose intolerant folks ended up living 4 years less than the normoglycemics, and 10 years more than the diabetics. One implication of this article is that perhaps you should not worry too much if you experience a temporary increase in blood glucose levels due to compensatory adaptation to healthy changes in diet and lifestyle, such as elevated growth hormone levels. It seems unlikely that such temporary increase in blood glucose levels, even if lasting as much as 1 year, will lead to permanent damage to cells involved in glucose metabolism like the beta cells in the pancreas. Another implication is that being diagnosed as pre-diabetic or diabetic is not a death sentence, as some people seem to take such diagnoses at first. Many of the folks in this study who decided to do something about their health following an adverse diagnosis probably followed the traditional advice for the treatment of pre-diabetes and diabetes, which likely made their health worse. (See Jeff O’Connell’s book Sugar Nation for a detailed discussion of what that advice entails.) And still, not everyone progressed from pre-diabetes to full-blow diabetes. Probably fewer refined foods available helped, but this does not fully explain the lack of progression to full-blow diabetes. It is important to note that this study was conducted in the late 1960s. Biosynthetic insulin was developed in the 1970s using recombinant DNA techniques, and was thus largely unavailable to the participants of this study. Other treatment options were also largely unavailable. Arguably the most influential book on low carbohydrate dieting, by Dr. Atkins, was published in the early 1970s. The targeted use of low carbohydrate dieting for blood glucose control in diabetics was not widely promoted until the 1980s, and even today it is not adopted by mainstream diabetes doctors. To this I should add that, at least anecdotally and from living in an area where diabetes is an epidemic (South Texas), those people who carefully control their blood sugars after type 2 diabetes diagnoses, in many cases with the help of drugs, seem to see marked and sustained health improvements. Finally, an interesting implication of this study is that glucose intolerance, as defined in the article, would probably not do much to change an outside observer’s perception of a long-living population. That is, if you take a population whose individuals are predisposed to live long lives, with many naturally becoming centenarians, they will likely still be living long lives even if glucose intolerance is rampant. Without carefully conducted glucose tolerance tests, an outside observer may conclude that a damaging diet is actually healthy by still finding many long-living individuals in a population consuming that diet. Heart disease risk increases in a linear fashion as fasting blood glucose rises beyond 83 mg/dl. In fact, I have seen this many times, including on some very respectable blogs. I suspect it started with one blogger, and then got repeated over and over again by others; sometimes things become “true” through repetition. Frequently the reference cited is a study by Brunner and colleagues, published in Diabetes Care in 2006. I doubt very much the bloggers in question actually read this article. Sometimes a study by Coutinho and colleagues is also cited, but this latter study is actually a meta-analysis. So I decided to take a look at the Brunner and colleagues study. It covers, among other things, the relationship between cardiovascular disease (they use the acronym CHD for this), and 2-hour blood glucose levels after a 50-g oral glucose tolerance test (OGTT). They tested thousands of men at one point in time, and then followed them for over 30 years, which is really impressive. 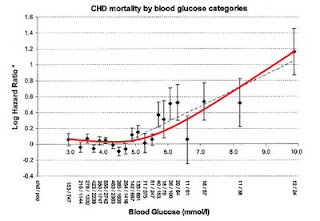 The graph below shows the relationship between CHD and blood glucose in mmol/l. Here is a calculator to convert the values to mg/dl. The authors note in the limitations section that: “Fasting glucose was not measured.” So these results have nothing to do with fasting glucose, as we are led to believe when we see this study cited on the web. Also, on the abstract, the authors say that there is “no evidence of nonlinearity”, but in the results section they say that the data provides “evidence of a nonlinear relationship”. The relationship sure looks nonlinear to me. I tried to approximate it manually below. 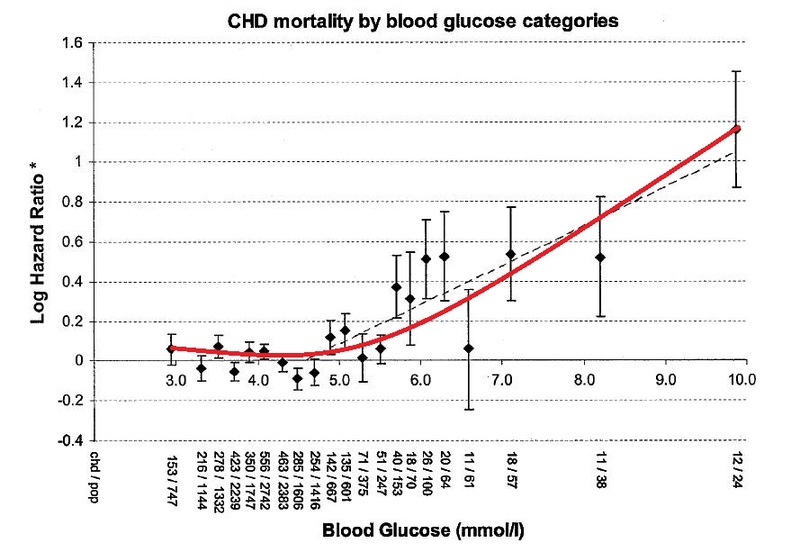 Note that CHD mortality really goes up more clearly after a glucose level of 5.5 mmol/l (100 mg/dl). But it also varies significantly more widely after that level; the magnitudes of the error bars reflect that. Also, you can see that at around 6.7 mmol/l (121 mg/dl), CHD mortality is on average about the same as at 5.5 mmol/l (100 mg/dl) and 3.5 mmol/l (63 mg/dl). This last level suggests an abnormally high insulin response, bringing blood glucose levels down too much at the 2-hour mark – i.e., reactive hypoglycemia, which the study completely ignores. These findings are consistent with the somewhat chaotic nature of blood glucose variations in normoglycemic individuals, and also with evidence suggesting that average blood glucose levels go up with age in a J-curve fashion even in long-lived individuals. We also know that traits vary along a bell curve for any population of individuals. Research results are often reported as averages, but the average individual does not exist. The average individual is an abstraction, and you are not it. Glucose metabolism is a complex trait, which is influenced by many factors. This is why there is so much variation in mortality for different glucose levels, as indicated by the magnitudes of the error bars. …. [CHD was associated with levels above] a postload glucose of 5.3 mmol/l [95 mg/dl], but below this level the degree of glycemia was not associated with coronary risk. Now, exaggerating the facts, to the point of creating fictitious results, may have a positive effect. It may scare people enough that they will actually check their blood glucose levels. Perhaps people will remove certain foods like doughnuts and jelly beans from their diets, or at least reduce their consumption dramatically. However, many people may find themselves with higher fasting blood glucose levels, even after removing those foods from their diets, as their bodies try to adapt to lower circulating insulin levels. Some may see higher levels for doing other things that are likely to improve their health in the long term. Others may see higher levels as they get older. Many of the complications from diabetes, including heart disease, stem from poor glucose control. But it seems increasingly clear that blood glucose control does not have to be perfect to keep those complications at bay. For most people, blood glucose levels can be maintained within a certain range with the proper diet and lifestyle. You may be looking at a long life if you catch the problem early, even if your blood glucose is not always at 83 mg/dl (4.6 mmol/l). More on this on my next post. Most relationships among variables in nature are nonlinear, frequently taking the form of a J curve. The figure below illustrates this type of curve. 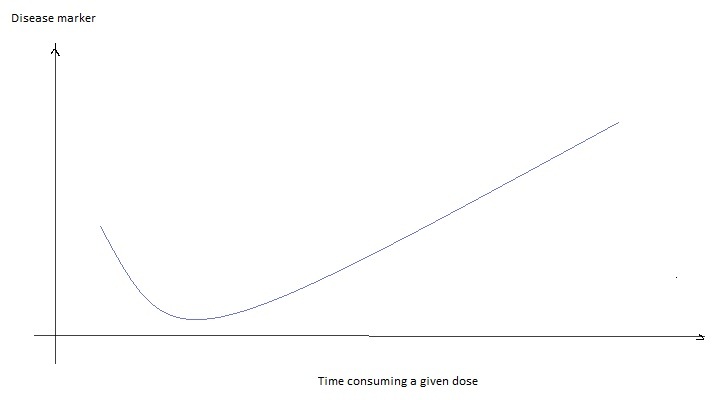 In this illustration, the horizontal axis measures the amount of time an individual spends consuming a given dose (high) of a substance daily. The vertical axis measures a certain disease marker – e.g., a marker of systemic inflammation, such as levels of circulating tumor necrosis factor (TNF). This is just one of many measurement schemes that may lead to a J curve. J-curve relationships and variants such as U-curve and inverted J-curve relationships are ubiquitous, and may occur due to many reasons. 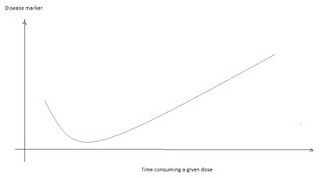 For example, a J curve like the one above may be due to the substance being consumed having at least one health-promoting attribute, and at least one health-impairing attribute. The latter has a delayed effect, and ends up overcoming the benefits of the former over time. In this sense, there is no “sweet spot”. People are better off not consuming the substance at all. They should look for other sources of the health-promoting factors. So what does this have to do with industrial seed oils, like safflower and corn oil? If you take a look at the research literature on the effects of industrial seed oils, you’ll find something interesting and rather paradoxical. Several studies show benefits, whereas several others hint at serious problems. The problems seem to be generally related to long-term consumption, and to be associated with a significant increase in the ratio of dietary omega-6 to omega-3 fats; this increase appears to lead to systemic inflammation. The benefits seem to be generally related to short-term consumption. But what leads to the left side of the J curve, the health-promoting effects of industrial seed oils, usually seen in short-term studies? It is very likely vitamin E, which is considered, apparently correctly, to be one of the most powerful antioxidants in nature. Oxidative stress is strongly associated with systemic inflammation. Seed oils are by far the richest sources of vitamin E around, in the form of both γ-Tocopherol and α-Tocopherol. Other good sources, with much less gram-adjusted omega-6 content, are what we generally refer to as “nuts”. And, there are many, many substances other than vitamin E that have powerful antioxidant properties. Chris Masterjohn has talked about seed oils and vitamin E before, making a similar point (see here, and here). I acknowledged this contribution by Chris before; for example, in my June 2011 interview with Jimmy Moore. In fact, Chris has gone further and also argued that the vitamin E requirement goes up as body fat omega-6 content increases over time (see comments under this post, in addition to the links provided above). If this is correct, I would speculate that it may create a vicious feedback-loop cycle, as the increased vitamin E requirement may lead to increased hunger for foods rich in vitamin E. For someone already consuming a diet rich in seed oils, this may drive a subconscious compulsion to add more seed oils to dishes. Not good!